An empirical technique — the O’Connell correlation — is widely used to estimate the efficiency of cross-flow trays. This article proposes a modification and clarifies the relationship between the empirical and theoretical approaches. 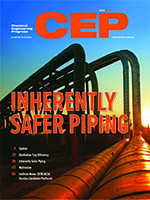 Several regulations and standards should be considered when you are designing a piping system. This article highlights elements of these codes and standards that are commonly overlooked. Motivation can be nebulous, appearing and then simply disappearing. In a team environment, it is vital that you ensure it stays put to drive results and reach goals.